Chuck Chellman’s Nashville based Renegade label didn’t release many 45s but they are all worth seeking out. The Jimmie Baker is perhaps the rarest of them all, and the fine Lattimore Browns the most common, but these two from Lee Martell shouldn’t be over looked. While “A House By The Side Of The Road” / “Everything Is Beautiful” is a bit too far countrified for me, A Good Woman falls firmly into the soul camp. I could listen to the guitarist behind Lee all day long, and the singer seems to be energised by the accompaniment putting in some lovely hoarse phrases and coming across much more positively than in the other 45. I’ve heard rumours – based on the writer credit no doubt – that Lee is in fact the same singer as Lee Bynem who cut “Two Warm Bodies” for True. There's the same country style, it was cut in Nashville as well and the singer has a similar light baritone voice. Can anybody confirm? UPDATE ~ The producer of Lee's Renegade 45s Chuck Chellman has confirmed that Martell and Bynem are the same guys. Sadly he also reports that he passed away several years ago. "Elzi Lee Bynem was bought up in Leesville, South Carolina, the son of Pastor Clarence Bynem. He began by singing gospel in a family group that included his sister; Thelma and brothers Leonard and DC. Later he sang secular music in clubs around Columbia, SC. His sister used the stage name Linda Martell and in 1969 was invited by Shelby Singleton to become the first African- American to sing at the ‘Grand Ole Opry’ in Nashville. She scored heavily with a version of ‘Color Me Father'. 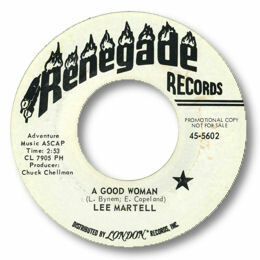 Brother Lee used the Martel surname on two 45s for the Nashville Renegade label. He reverted to his own name in 1979 for a single on True ‘Two Warm Bodies’. He died in Duval, Florida in 1990." Thanks to Garry Cape for the new info and to Greg Burgess for the details in the New Update.